Gorgeous 4 Bedroom, 3 Full, 1 Half Bath home with 2,305 square feet of finished living space. This beautiful property is located on a .77 acre lot in the Old Spring House Farms neighborhood. The open design features a vaulted Great Room featuring a fireplace, hardwood flooring and a beautiful view to the covered deck and backyard. Welcome guests into the 2 story Foyer which leads to either the Formal Dining Room or the spacious Great Room. The nicely equipped Eat-In Kitchen, which is open to the Great Room, offers stainless steel appliances along with plenty of cabinet and counter space. Retreat to the huge first floor Master Suite then relax in the spacious Master Bath with double sink vanity, separate shower and large whirlpool tub. The Laundry is conveniently located on the 1st floor. Upstairs are three large Bedrooms and a Full Bath. One bedroom is currently used as an Office. Endless Possibilities in the Basement. There is a finished Full Bath and plenty of space to design a Family Room, Game Area, or Bedroom. Enjoy your morning coffee or keep the party going on the Deck overlooking the huge backyard. In addition to the attached 2 car Garage is a second 2 car Garage which is detached. Great for storage or a workshop! 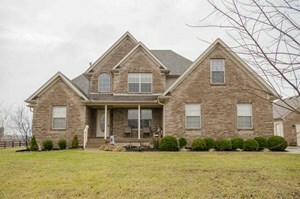 A beautiful home situated on a large lot with so many wonderful features. Click to schedule your showing.